Nightmares and the realm of dreams. They’re not a new target for horror movies. Indeed, a certain burnt-faced man in a green and red striped jumper with a beknived hand got there a good few decades ago. But they’re still ripe for the picking, owing to the fact that we can’t control our dreams or where they take us. For the most part. Let me tell you a little story… You see, when I was a young Phage I used to suffer from extreme nightmares. Ones that would involve a car full of silhouettes pulling up outside my house and running at the building whilst Momma Phage slept upstairs. I would run downstairs and see them running and jumping in through the windows – they had no faces, no features, nothing. Just silhouettes. Similarly, I’d see images of beloved ones warping into demons and attacking me. These were relentless and they’d come again and again, night after night. That was until I learnt to lucid dream and control what happens. So I was able to talk to these demons and attackers. Once I did? No more of those nightmares. I cured myself of these insidious thoughts. If you’re thinking about seeing Insidious: Chapter 2 and you’ve not seen the original? Well, you’re going to struggle. Pretty badly! This movie doesn’t make many apologies for this and plunges relentlessly into the plot. I’ve seen Insidious… and to be honest, I thought it was “good” but by no means this “great” horror that people laud it as. It had a nice premise, but lost all terror in the last third. Having said that, I do remember the plot. But having not watched it since its theatrical release, even I found myself straining to remember the closing 10 minutes of the original. I got there… but it wasn’t instant recall! Essentially, this film picks up immediately after the first – a little boy became trapped in dream world with some demons, his dad (Patrick Wilson) followed him into there to bring him home. But we’re not sure just what came out of that world, as an evil “old woman” was trying to get back to Wilson‘s body before he did… did she succeed? Well, Wilson did kill at the end of the first movie, so we’d presume so, right? 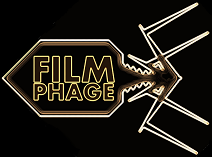 Oh, and if you’re wondering, I’d have given Insidious 3 Phages. Why? Too much reliance on my old enemy… LOUD NOISES! And LOUD NOISES are very much in place in Insidious: Chapter 2 too. Not as many as there have been previously, but there’s certainly a reliance on them. Let’s be honest… there’s little in the way of true scares in this film. A couple of jumps, but that’s more due to clever framing, as opposed to genuine horror. No, The Conjuring this ain’t. I should mention we saw The Conjuring, but flew abroad straight away afterwards. Verdict? We really liked it – 4 Phages. Jeez, we’re writing reviews within reviews here aren’t we?! I would however like to mention the humour. Insidious: Chapter 2 did have me smiling – for the right reasons. 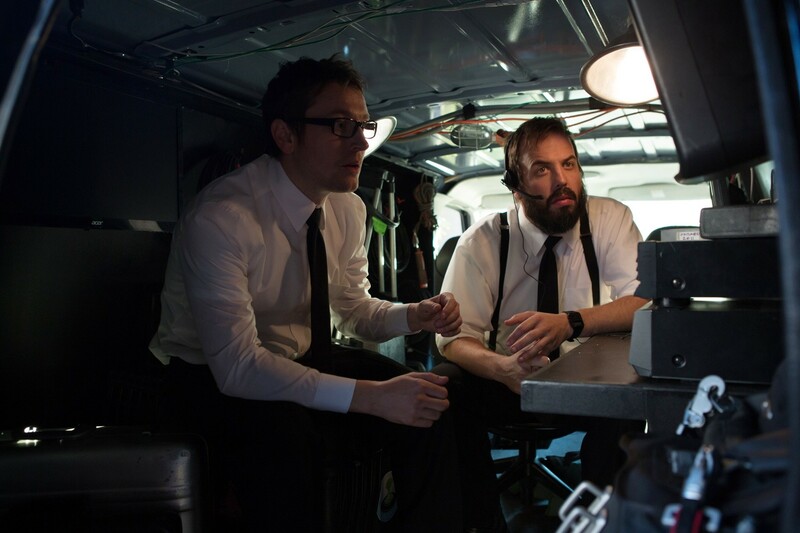 The comedic performances coming out of “paranormal investigators” Specs (Leigh Whannell) and Tucker (Angus Sampson) were brilliant. Truly, they were the highlight of the movie for me. The others? Well… they were there. Not bad, by any stretch of the imagination, but nothing too memorable. 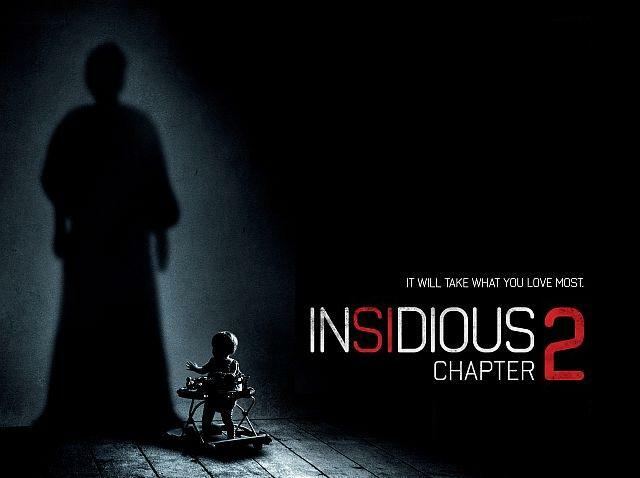 Insidious: Chapter 2 is pretty much on par with the original Insidious in my books… and I wasn’t bowled over with the original, like so many were. This sequel should be applauded for continuing the plot and being a true sequel, but it falls down in terms of horror and suspense. I enjoyed the movie more as a comedy than I did a horror thanks to the performances of Whannell and Sampson. But even that wasn’t enough to save the movie. It was passable… but certainly not remarkable. Maybe I’m just not able to be scared by horror movies now, following my earlier confession about my somewhat bizarre nightmares that I concoct for myself nowadays. In fact, I’m pretty sure my dreams and nightmares are ripe for the picking, as they’re pretty warped and weird. Although I’m not sure how you convey the feeling of malevolent evil that I can sense once I’m in there. Maybe if we held the screening and announced that one audience member would be picked at random and subjected to the horror that is having to watch Adam Sandler‘s Jack & Jill on a loop for an entire weekend… that’d do it. This entry was posted in Review and tagged dreams, ghosts, horror, Insidious, Insidious 2, Insidious: Chapter 2, James Wan, lucid dream, Nightmare on Elm Street, nightmares, Paranormal Activity, Patrick Wilson, Saw, The Conjuring. Bookmark the permalink. Good review. While the first one was no masterpiece of any kind, it still had its fair share of jumps and scares. This one, not really. More laughter than actual scares.